The shiny, evergreen, cabbage-like leaves of Bergenia have a unique leathery appearance that is really eye-catching. From early to late spring, bright pink flowers appear in clusters on thick stems just above the foliage. These flowers and the leaves are both long-lasting when cut for bouquets. During the autumn and winter months, the leaves take on remarkable reddish-bronze hues which remain until spring when they turn back to green. Any tattered leaves can be removed at that time. Bergenia can be used in a variety of ways in the landscape. It is most impressive when used as a durable, evergreen groundcover, but it can also be used in containers and rock gardens. It is quite effective at softening the hard edges of paveing and also works well as an edging or filler plant in flower borders. 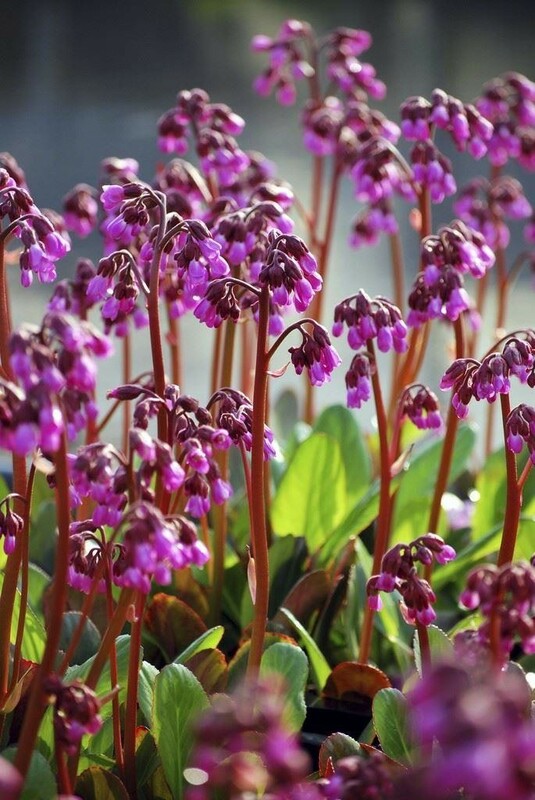 Bergenia thrives in almost any amount of sunlight, but partial shade is ideal. Plants will always perform the best in rich, moisture-retentive soil. However, it dislikes heavy soils and standing water. Supplied in 2 litre containers.